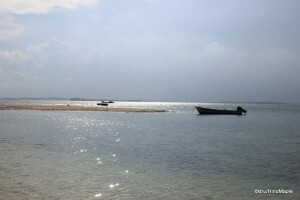 Nikoi Island is a small resort island that is less than 1 km across. 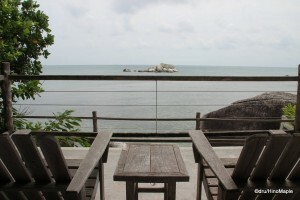 It is located close to Singapore and just off the east coast of Bintan Island in Indonesia. 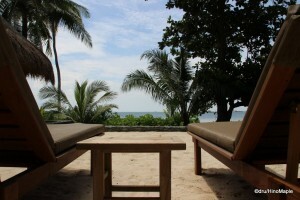 Bintan itself is a mix of a segregated resort area on the north and the main island to the south. 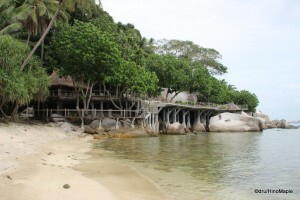 Nikoi Island is situated just 15 minutes east of Bintan Island. To get there, you must start off at the Tanah Merah ferry terminal in Singapore where you can take a 1 hour catamaran ride to Bintan Island. 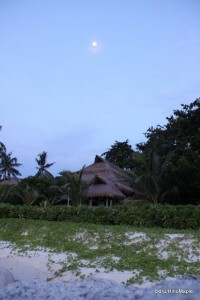 You arrive at the north western point of the island where you are greeted by the Nikoi Island people. 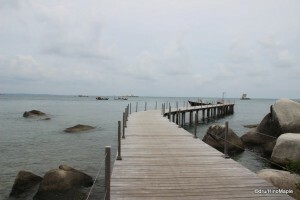 Their own private cars take you to their ferry port located on the east side of Bintan Island. You then quickly board Nikoi’s private boat for a short 15 minute journey before you arrive at the Nikoi. In total, it shouldn’t take more than 5 hours, including wait times at the ferry terminal and so on, but if you time it right, it would be around 4 hours to get there from central Singapore. When you arrive at Nikoi Island, you land at the northern point of the island. Since you are coming from the west, you can see a lot of the island as you approach. The main pier is about 200 metres from the main site. 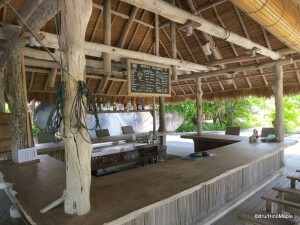 It is a short walk to the check-in bar, officially known as the Beach Bar, and the entire process has been rehearsed by everyone, except the first time guests of course. 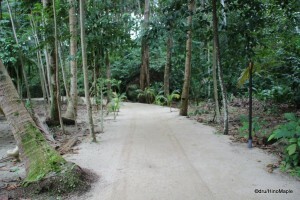 As you walk to the main area, you walk through part of the jungle area of the island. Most of the island hasn’t been developed so you can enjoy quite a bit of the nature Indonesia has to offer. 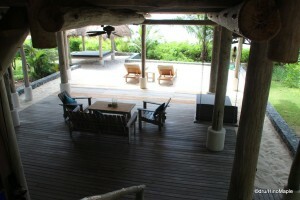 As you approach the check-in bar, you can even see some of the villas that you will be staying in. I passed by my own villa which was a simple 1 bedroom and 2 bath villa. The entire place was very simple. 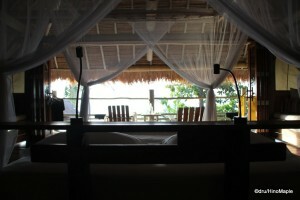 You are placed in a villa that is almost completely natural. 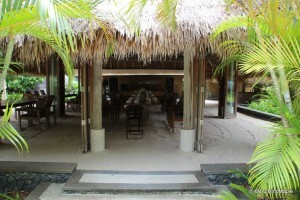 The roof and flooring was made of items from around the island and nothing was destroyed to make it. All of the floors and main posts were made of drift wood and the roof was a thatched roof made of what I can only imagine is a local grass. The only non-natural items in the cottage were the screws to hold things together, the electrical fixtures, and the toilets. Other than that, almost everything was natural. You get your own 2 floor paradise to enjoy. The first floor has an open living room and a beach patio. You even have a small covered seating area for massages if you request one. The patio is great for sun tanning and sure enough I did a lot of that. The first floor also has a bathroom for cleaning up after a dip in the ocean and there is also a shower located just outside your villa, near the beach, so that you can rinse off before getting back into your villa. The second floor is your private area. It can also be completely open if you choose, but you can also close everything, but there really is no need to do that. For security, the doors at the top are secured with a wooden block between the handles. On either side, I had small balconies that functioned more or less to allow air to flow through. The back had a bathroom and shower with hot water as the main floor bathroom didn’t have hot water. 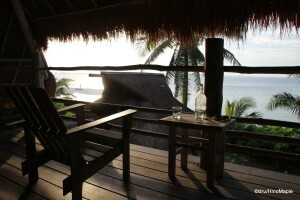 There was also a spacious “balcony” where you can enjoy the view of the beach and the sea. In fact, as I write this post, I am actually sitting at said balcony. I have never enjoyed blogging so much in my life! Nikoi Island is surrounded by the sea, so there really is no need to have a pool, but Nikoi Island has a couple small pools available for you. They are located just east of the main pier and few people use it. The north side of the island was not frequented by too many people when I visited and can be a nice quiet place away from everyone, but in reality, there are so few people on the island you can enjoy privacy just about anywhere. The pools have a great view and they capitalize on the area by placing seats everywhere they could and giving you nearly unobstructed views of the sea. The only problem with the view at the pool area is that they used natural products as much as possible; so instead of a nice glass railing that you could see through, they positioned the railing roughly at eye level when sitting down so the view is not as great as it could have been. Unfortunately, safety first is very important as if they didn’t have the railing, people could actually fall and get hurt as the pool area is built on top of a rocky area and the drops are a little high. Behind the pool is an access to a beach where you can continue your walk around the island, but be aware that you can only walk around the island during low tied, unless you are willing to walk in the water. I couldn’t see the rocks easily so I decided to head back to the main camp the same way I came. I do wish I walked completely around the island, but timing is very important and the difference in sea level between high and low tide is actually not big, so it was difficult for me to know when it was high tide and when it was low tide. The main resort area is where you’d spend most of your time. From the main pier, the first thing you come upon is the Beach Bar. There are a total of 3 bars on Nikoi Island. 1 is located at the pool and 2 are in the main area. 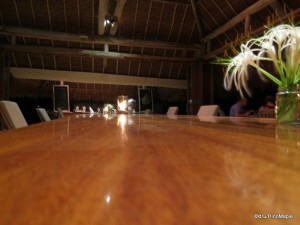 The Beach Bar is a smaller bar with just counter seating and a few seats to enjoy the view of the beach. It is more of a backup bar in the main area as they promote the Sunset Bar/Lounge. 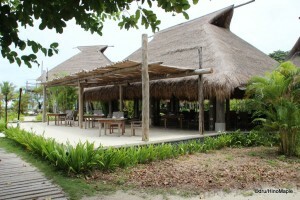 Next to the Beach Bar is the family eating area. There are 2 eating areas: one for families and one for couples. The family eating area is predominantly suited for those with children and groups whereas the couples area is, as the name says, suited for couples. The Savior and I dined in the couple’s area only and it was lovely. There are about 5 tables set towards the sea and they are the first seats to go. Inside the main area is the communal table. In the couple’s area, the communal table is a very long wood table and they allow enough space that you don’t have to worry about others listening to you, unless you are pretty loud. 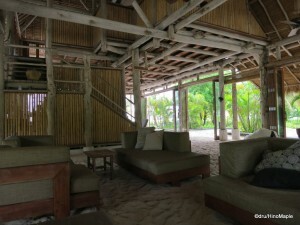 The entire area is sand covered so you can pretend you are right on the beach rather than in a hut next to the beach. 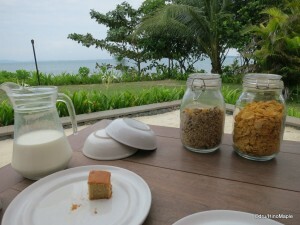 The sand is really nice and fine and feels great when you are enjoying a nice meal. The people at the dining area are really great. From the moment we walked in, they were very friendly and while I couldn’t always understand what they were saying, they always served me with a smile and made me feel welcome. They remembered us each time, although with only 15 cottages on the island, I’m sure it isn’t too hard to remember us, at least by face. They often made a little small talk such as where we were from and also introduced the next meal to us. You can make requests regarding the next meal and I’m sure they’d remember it. The entire island is paradise. You may want to avoid going into the jungle as I took a short trip there and got eaten alive by mosquitoes in just 10 minutes. Keeping near the beach where it is pretty hot will keep you safe from the majority of the mosquitoes. Your room will have some friendly insects but that is the price you pay for living in an open villa. You really have to just enjoy the setting and remember that it is camping in luxury. There was no point getting upset at the fact that there were ants in my bathroom or the fact that sand was everywhere; I was the one who brought the sand in in the first place. There are a lot of things that can be considered bad about Nikoi Island, but the key to enjoying the island is to just enjoy it. There is very little in the way of communication with the outside world and as long as you are prepared to just enjoy your time doing almost nothing, you’ll love it. You can enjoy the beach, read a book, watch a movie on your computer if you bring it, or just sleep all day. You don’t have to do anything that even resembles work. Well, I am writing this post while enjoying the view from my balcony, but what better way to remember this trip than to write the ideas as I am experiencing it! This entry was posted in East Asia and tagged Asia, beach, Bintan, Bintan Island, Indonesia, jungle, Nikoi, Nikoi Island, paradise, Resort, Singapore, South-East Asia, Tanah Merah, Tanah Merah Ferry Terminal by Dru. Bookmark the permalink. Wow! I want to stay in that villa! I need to go there NOW. As in, right now. Immediately.